In some Puranas the list is bit different, Sarpih is replaced by Sanpi; Dadhi is replaced by Dahi, Svadhu by Jala and Udaka by Rasa. In the list Lavana is salty, Iskhu is sour, Sanpi is bitter, Dahi is curd, Dughda is milk, Jala is water and Rasa is juice. In a story mentioned in the Uttara Kanda of the Ramayana, a 100-headed demon named Satakantha lived in an island-city named Mayapura and the island was surrounded by Dadhi Sagara – sea or curds. Interestingly, Rama and Sita travels through all the above said seas to reach the island of the demon. 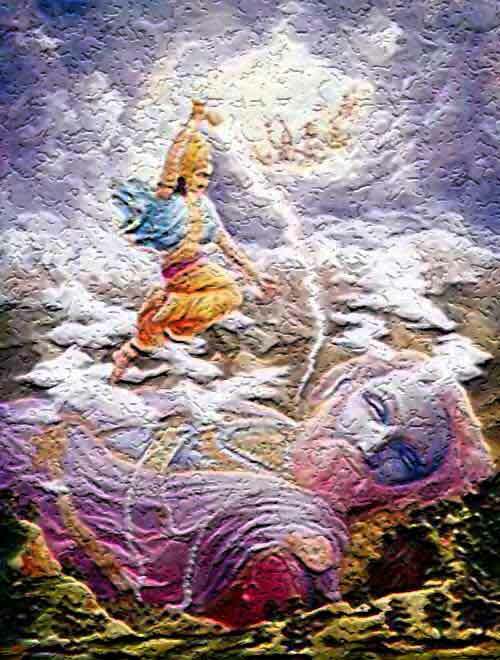 This demon was killed by Mata Sita who took on the form of the ferocious Bhadrakali.